Peche Cardinal is a lactonic peach. The opening peach schnapps and toasted coconut. This is accented by juicy, ripe purple berries and crushed fig leaves. It’s not listed, but I’m also reminded of plum preserves. There’s a lot of tuberose in Peche Cardinal. You know how so many tuberose perfumes can be cool, mentholated and give you the cold shoulder? Well, that’s not what is in there. The tuberose in Peche Cardinal is thick, creamy custard with warmth from tropical sunshine. The heart pairs the tuberose and syrup-y peaches with a creamy ylang-ylang and Madonna lily. The dry-down is also warm with a creamy sandalwood, toasted coconut and a “warm skin” musk. What I love about Peche Cardinal is that it is trashy…but fancy. So, I think of it like designers that are basically made tacky into something expensive (think Versace or Roberto Cavallli). This perfume could easily be a mess but it all works together. Another thing I like about it – it seems mature but it’s also youthful. I sort of think of it like the party-loving, tiki-cocktail-drinking great-great-granddaughter of Piguet Fracas. Give Peche Cardinal a try if you like the thought of a fruity, tropical tuberose perfume of you want a peach-centric fruity-floral. Or perfumes like Piguet Fracas, Versace Blonde, Dusita Melodie de L’Amour, April Aromatics Tempted Muse and/or Kat Burki Tubereause. Projection is average to above average. Longevity is average. So, the MDCI line is known for it’s over-the-top packaging that looks like it would be in one of the many bathrooms in Tony Montana’s mansion. The bust bottle pictured above is more expensive. They also offer one sans bust that is cheaper (just has a cold cap with a tassel). Both bottles are 2 oz. The bottle with the bust is $375. The one sans bust is $250. These are available at Osswald. Samples are also available for purchase. 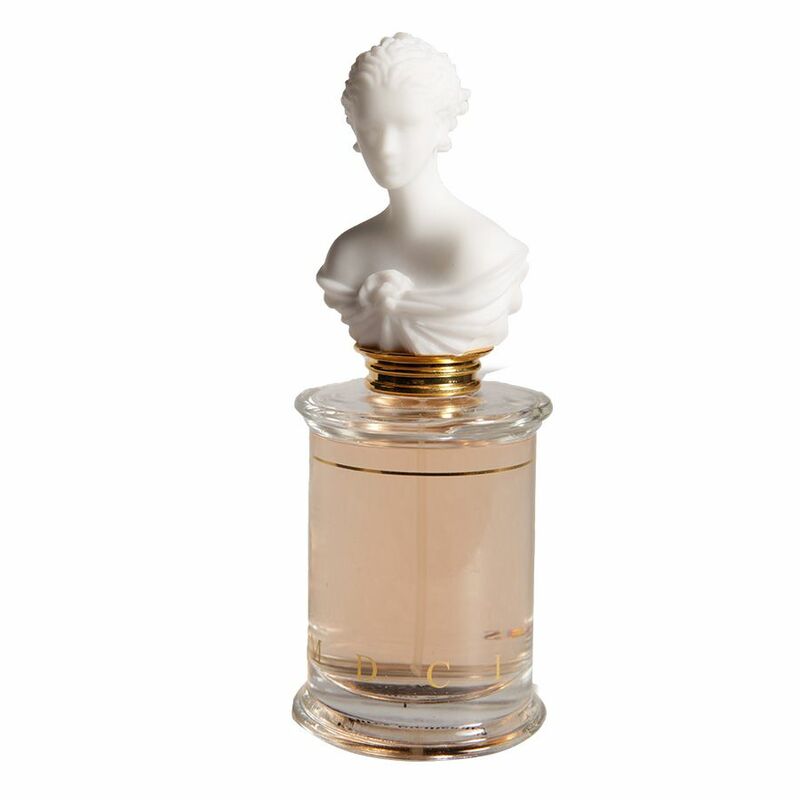 Victoria’s Final EauPINION – Milky tuberose and peaches. Basically what I love about this perfume is that it is fun but substantial. *Sample obtained by me. Product pic from Essenza Nobile. Janis Paige pic from worthpoint.com. I have a sample somewhere and I must hunt it down! I generally love MDCI- 3 FB – and your description of Pèchè Cardinal makes me think a 4th is in my future. Thank you for your reviews. They are informative and entertaining. I think the MDCI line is solid. I haven’t tried them all (so there’s a high chance of there being duds), but the ones I have tried, I’ve really liked. Anyway, I highly recommend this one to anyone that likes tuberose or are looking for a fruity-floral that feels mature without feeling “stuffy”. Rush by Gucci is a high-pitched peach. I love wearing it, to feel like a flirtatious tart!